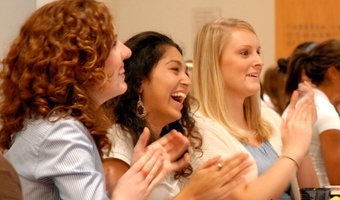 A Taste of NC Triangle Ellevate: Experience Your Chapter’s Events, Partnerships and Fellow Members! The Research Triangle Park > Events > The Frontier > A Taste of NC Triangle Ellevate: Experience Your Chapter’s Events, Partnerships and Fellow Members! Why should you attend? We’re a close-knit, high-energy network of women seeking to help others accelerate their careers… and we want to take yours to the next level! Who are we? We’re a passionate, authentic community. We’re a diverse mix of resources from tech, biopharma, financial services, agency, HR, among other industries. We wholeheartedly believe in connecting other women to the right resources, at the right time, to help you take charge of your career path and own it. Networking Roulette: a mini-twist on our Mix & Mingle Events! Network with a purpose and making meaningful connections in a matter of moments with this fun version of speed-networking! Frontier Entrepreneurship at its Best: Abby Gingrich from The Frontier will share how The Frontier can be used as a key resource for helping professional women and entrepreneurs alike in our RTP community. Hear from current female Frontier members as they describe their path to entrepreneurship! Fireside Chat – Hear from Chapter President Katie Detwiler and Programs Lead Nicole Case on investing in other women, Ellevate Network, and taking charge of your own career path. Small Group Roundtable Roulette: A mini-twist on our Leadership Lunches. Hands-on, interactive discussion that incorporates advice and key quotes from inspirational women. We’ll keep you moving and on your toes, to get new ideas flowing in small groups! Taste of NC Triangle Ellevate – Did we mention that we’ll have cool treats and tastings to accompany this new twist on networking? Are you tired of the same, old-fashioned networking events? We are, too. Time to own it.